A jam packed crowd this past Saturday night was treated to some exciting racing at “The Bullring” as the Patriot Sprint Tour was in town on Tackaberry Construction night. A fast tacky surface provided some great action in all divisions. The Patriot Sprint Tour was ready to go for 25 laps as Constantia New York’s Jason Barney led the field of 24 drivers to the green flag with Barney grabbing the top spot heading into turn 1 over Steve Poirier, Devin Caron, Rick Wilson and Parker Evans. The top 2 drivers Barney and Poirier were the first to break free of everyone and put on a fantastic side by side battle for the lead with neither driver giving an inch. Just behind the leaders Evingham Site Excavating Dash winner and current series points leader Jared Zimbardi was on the move from his 9th starting spot. “The Juice” moved into the 4th spot on lap 12 getting by Parker Evans and was in pursuit of the top 3 before the first yellow flew for a spun Dylan Westbrook in turn 1. On the restart Barney continued to lead but Poirier was trying to find a way by. On lap 15 Poirier made a brave move on the top side off turn 4 to take over the position while Barney held on to 2nd with Devin Caron, Jared Zimbardi and Parker Evans completing the top 5. Poirier began to pull away from everyone and looked to be heading to his 2nd win of the weekend. However the caution flew for Cory Turner who slowed off turn 3 with problems. Under the same caution race leader Steve Poirier headed to the pits with a flat tire. He would get it changed and return to the speedway but was not a factor at the finish. On the restart with 9 to go Barney continued to lead but Jared Zimbardi was closing fast and looking for his 5th career win at Brockville. 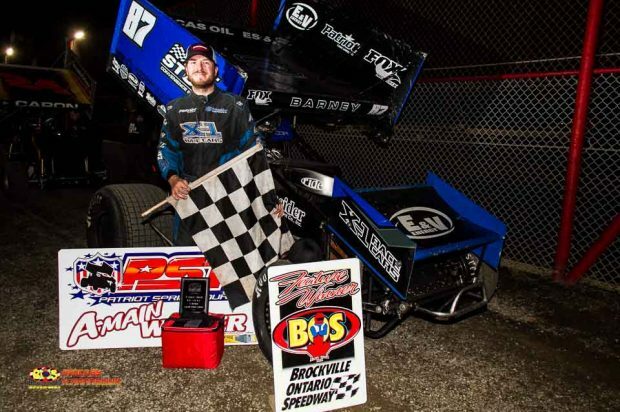 Zimbardi tried several times to get by but it wasn’t enough as Jason Barney duplicated his great run last August scoring his 2nd PST Canada Series win of the year over Jared Zimbardi, Devin Caron, Parker Evans and Matt Tanner who got by Rick Wilson for 5th at the line. The 358 Modified division also had a fast racing surface to deal with and this was good news for Gage Morin who took the lead from the outside pole over Tim O’Brien, Ryan Poole, Andy Lloyd and John Mulder. Morin had without a doubt the fastest car on the speedway as he drove away to a comfortable advantage by lap 5 as Tim O’Brien looked to close in from 2nd while Poole, Mulder and Lloyd were all locked in a great top 5 battle. Morin began to enter lapped traffic just past the halfway point and was on rails on this night. Behind the top 5 drivers Danny O’Brien and Bobby Herrington were on the move having moved into the top 5 by lap 14 and were trying to find a way to run down Morin and Tim O’Brien. On lap 16 Dana Aikins slowed with a problem in turn 2 which brought out the first yellow of the night. On the restart Morin was able to get away from the field with Tim O’Brien still 2nd with Bobby Herrington getting by Ryan Poole for 3rd and Danny O’Brien still 5th. Morin started to pull away from everyone once again and was on pace to score win number 2 of the year. Behind him Tim O’Brien was in a battle with Herrington and Danny O’Brien and this battle did not disappoint. Herrington and the O’Brien brothers put on a fantastic show for the fans as Danny O’Brien would eventually move to 3rd, getting by younger brother Tim and was on the charge and looking for the leader. On lap 26 the final caution flew which bunched up the field for the last restart. When the green flew Morin was in complete control while Danny O’Brien charged by Herrington for 2nd and tried at will to catch Gage Morin. After a great run came to an end on Friday night at Mohawk, Gage Morin got redemption at “The Bullring” as he held off Danny O’Brien to score his 2nd win of the year with Herrington, Tim O’Brien and Stephane Lafrance who came from 9th on the grid to finish up 5th. The Sportsman event saw Zac McBride take away the lead from the pole position over Brian Comeau, Tristan Draper, Johnathon Ferguson and Jason Cummings. In just his 2nd season in the division McBride has been impressive over the last few weeks and was looking for his first ever win while behind him Tristan Draper was doing all he could to take over the top spot. However the caution flew right away for a 4 car pileup which nearly took out points leader Shane Pecore. Shane Stearns received the most damage in the crash and was towed to the pits. When the green flew Tristan Draper went right to work as he grabbed the top spot away from McBride and began to pull away. By lap 8 Draper was comfortably out front as Zac McBride was doing all he could to hold off Johnathon Ferguson, Shane Pecore and Ryan Scott. Pecore started to charge forward getting by Ferguson and closed in on the back bumper of Zac McBride for 2nd. Behind the top 5 July 2nd winner Steve Barber was moving forward from his 14th starting spot as he moved into the top 5 after a big move getting by both Ryan Scott and Zac McBride. At the front of the field Pecore was inching closer to the Tristan Draper machine. On lap 18 Pecore used the bottom side to take over the lead and begin to pull away. Over the final 8 laps the 2 time track champion and current points leader was on cruise control as he drove on to score his 2nd win of the season over Draper, Ferguson, Steve Barber and Ryan Scott. In Rookie Sportsman action Dan Christiensen was showing his muscle on this night as he jumped into the lead from the pole over Tyler Parker and Anthony Rassmussen. Up to this point of the year Christiensen’s best finish of the year was 5th back on June 4th but had a car on this night that was capable of winning. On lap 6 Suzi Roy lost the handle on her machine. On the restart Christiensen continued to lead but Derek Cryderman was on the charge as he came to 2nd on lap 8, then quickly ran down the race leader. With 5 laps remaining Cryderman pulled by Dan Christiensen on the top side of turn 4 bringing Anthony Rassmussen to 2nd. Over the final 5 laps both Cryderman and Rassmussen would put on a fantastic battle for the lead. On the final lap the top 2 raced side by side for the lead, as they came off turn 4 Rassmussen pulled alongside on the bottom and made it close at the finish. However Derek Cryderman had just enough to hold off the youngster at the line for his first ever win over Rassmussen, Jacob Clancy, Tyler Parker and Matthew Barbour. In the Street Stock 15 lap event Xavier Andrews was looking to once again put the bad luck behind him as he took over the top spot on lap 3 with Brock Cullen, Todd Raabe, Sheldon Hoogwerf and Steve Brady making up the top 5 early on. On lap 3 Michael Dillon slowed with a flat tire bringing out the first yellow of the night. On the restart Xavier Andrews continued his great run but Brock Cullen was doing all he could to get by but didn’t have enough at this point as Andrews remained in control with Raabe still 3rd, Perry Como 4th and Hoogwerf now 5th. On lap 6 the 2nd yellow flew as Jason Fetterly slowed un turn 2. When the green flew the top 3 still saw Andrews, Cullen and Raabe in the mix but Tyler Bushey was on the charge from the back of the pack moving to 4th with Hoogwerf still in 5th. Andrews had a dominant car and was looking like he was well on the way to his 3rd win of the season until lap 11 when the final yellow flew for Nick Gauvreau who spun in turn 1. When the green flew Brock Cullen knew he had to make his move soon as he tried to get by Andrews. The sophomore driver was up to the task as he held off all challenges until the final lap. Both Cullen and Andrews raced side by side into turn 3 with neither driver backing down. As they exited turn 4 to the checkers Cullen and Andrews made contact to the checkered flag and in the end Brock Cullen would edge out Xavier Andrews to score his first win of the 2016 season over Raabe, Tyler Bushey and Sheldon Hoogwerf. The Mini Stocks closed out a great night of racing with their 15 lap affair and John Lemarsh took the lead at the drop of the green flag but points leader Bob Ray was already moving forward coming from 9th on the grid to run in spot number 2 with Jorden Healey, Chris Bakker and Melissa Gifford giving chase. On lap 3 Ray wasted no time grabbing the lead bringing Teddy Baird to the 2nd spot with Lemarsh, Kurtis Daye and Colin Tracey rounding out the top 5. As the laps wound down some invaders were making a bing charge to the front as Cornwall regular Francis Blanchette would move to 2nd with 5 laps remaining with last year’s Street Stock champion John Gifford now 3rd with Daye and Lemarsh making up the top 5. Over the final laps Bob Ray had the best car on the race track and would run away from a quality field to score his 3rd win of the 2016 season over John Gifford, Francis Blanchette, Kurtis Daye and John Lemarsh. Next week a full slate of racing is set to go in all 5 classes along with double features for the Outlaw Vintage Modifieds. The racing action begins at 7pm.